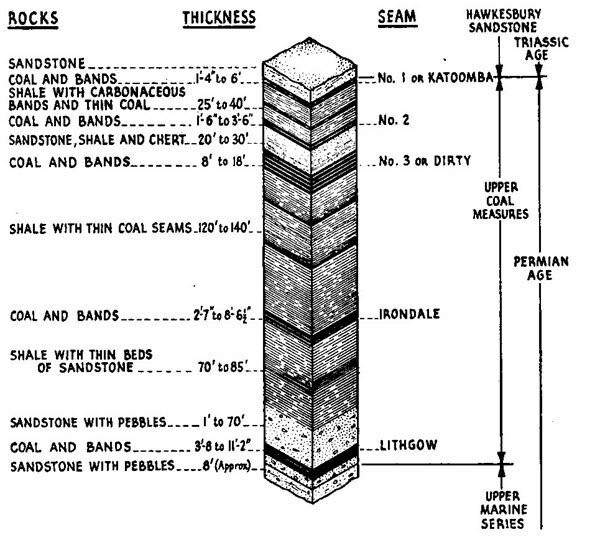 The following article is from the book "Coal Mining in Australia", written by Elford and McKeown and published in 1948. The State coal mine, owned by the New South Wales Government, is situated 1 1/2 miles north of Lithgow and 96 miles west of Sydney. 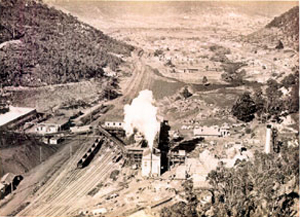 The mine was acquired by the Government in 1919 and coal production was commenced in 1922. The area of the property is 12,000 acres. The State Mine is working the No. 7 or Lithgow seam, having an average thickness of 11 feet, of which only the lower 6 foot 4 inches is extracted. In the upper sections, the coal has an ash content of 25% and is not mined. What is known as the holing band consists of 10 inches of good coal that forms the bottom of the seam. Above this is 5 foot 6 inches of solid coal, free from dirt bands. Above this coal is the bluestone band consisting of 3 to 6 inches of carbonaceous shale, which is left in situ in other collieries but is broken and partly sorted underground in the State mine. Calorific value of the coal underlying this band is 12,590 BTU and of the overlying coal, 10,704 BTU. Click on diagram for a larger version. 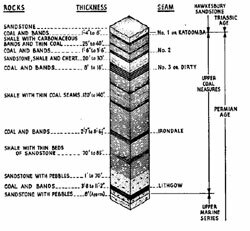 The seam is 270 feet below the surface at the main shaft, dips uniformly to the north-east at 1 in 40 and at 5 miles north lies under 1,250 feet of cover. The floor of the seam is shale and the roof is shale and sandstone. There are no known faults in the leases. The seam has been intruded by dykes, which have hardened the adjacent coal. The coal is essentially a steam coal and produces a good coke, rather high is ash. Gravity Kip at 3 miles in. 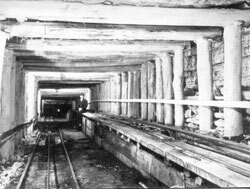 The mine is worked through a downcast shaft, 20 feet in diameter, an upcast shaft 19ft in diameter, both concrete lined and a No. 3 shaft, 18 feet in diameter, three miles to the north. The layout for future working provides for isolations of districts by barrier pillars and, in preparation for mechanization, rectangular turnouts will be abandoned in favour of an angled turnout suitable to the movement of mechanical units. At present all coal is hand mined and grunched. Hand filling is general, except in some development places, worked with scraper loaders, from which 15% pf the total output is obtained. Scraper loader places are operated by a team of four men, who bore, fire, timber and fill the skips, which are hauled by horses to the flat, a distance of up to 200 yard. An output of up to 100 tons per shift is possible, but normal output per team is 46 to 48 tons. The time for filling a skip of 22 cwt capacity is 30 seconds to one minute. In hand mining, one-man places are worked. Average output per miner on contract, who bores, charges, fires, timbers and fills, is 10.4 tons per man shift. The average time for hand loading is 12 minutes per skip containing 28 cwt of coal (heaped capacity). Power boring is used in those sections served with 415 volt current. In a 15 feet by 7 feet 6 inch face, 10 holes are bored to a standard pattern. Four parallel holes, directed upwards, are bored 18 inches below the roof. Six holes, placed 18 inches above the floor, are also bored upward. The two center holes form V cut, the holes on either side are parallel to the cut holes, while outside holes are parallel to the rib. Shots are fired singly by the battery of the miners cap lamp. Leads from the electric detonator in the charged hole are plugged into the base of the cap lamp and the shot fired by a push button switch. Leads up to 100 yard are used, provided the resistance does not exceed 2 ohm. The method is safe and efficient. 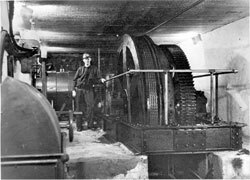 Coal is transported to shaft by endless rope, traveling at 1 3/4 m.p.h. and operated by 300 h.p. a.c. motor. This hauls skips of 22 cwt (level) or 28cwt (heaped) coal capacity and 9 cwt tare, in sets of 12, on 2 feet 6 inch gauge track. Push-button control is provided and re-railing keps are installed. Subsidiary to the main system are five branch endless rope haulages, driven by 50 h.p. motors. 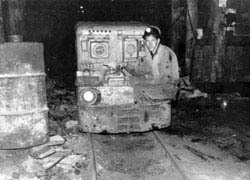 Battery loco used for haulage underground. A storage battery locomotive of 275 amp. 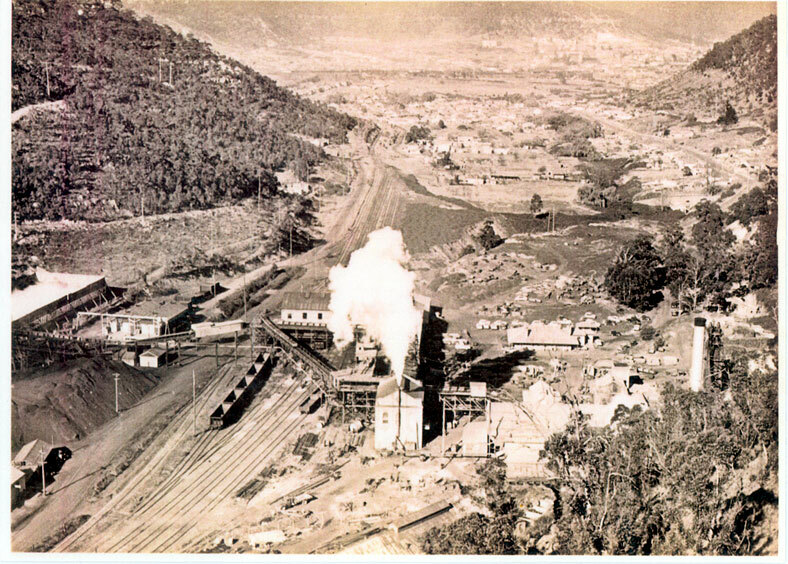 hour capacity provides subsidiary transport of coal and men from the faces to the main rope. Men are transported underground to and from the shafts on a set of 12 trollies, carrying a total of 360 men. The system is installed in the return airway and is operated by reversible endless rope at a speed of 8 m.p.h. Each fourth trolley is fitted with a lever-operated emergency brake, in charge of an official. The set rider can signal the engine driver while in transit by means of signal wires carried on props alongside the roadway. Winding engines and main ventilating fan are steam-driven from the mine boiler plant. Electric current is purchased from the Railway power house, 300 yards distant. Steam is generated in two Lancashire boilers. Superheated steam, at 750 deg F. and 160 lb. sq in. pressure, is delivered from the Railway power house through an insulated main. Steam is admitted along the full length of the bottom of each boiler, in which the furnace and flues are blanked off, through a 6 inch diameter pipe with numerous apertures. The boilers are filed to normal working level with feed water, which is converted into steam by the superheated steam. Two boilers using superheated steam have displaced seven hand-stoked boilers which were insufficient for the load.